The Hollywood Wax Museum Entertainment Center is one of the most visited attractions in Branson where you can see not only wax figures of biggest Hollywood stars but you can enjoy also other exciting activities offered in this fascinating tourist attraction. As you step into the museum, you will see great features of movie memorabilia, collectibles, and souvenirs that you can take home with you. And if this is not enough for you, you can enjoy more fun at Hannah’s Maze of Mirrors, Shoot for the Stars mini-golf, and at the Castle of Chaos (a 5D interactive thrill ride). As one of the most unique attractions in Branson, Hannah’s Maze of Mirrors offers exciting indoor adventure which is ideal for fun-seekers of all ages. This top-rated adventure is great for families, couples, and tour groups. As you take an exciting adventure to the world of mirrors, you’re sure to enjoy a fun and interactive experience that brings smiles to your face. When you visit this fascinating attraction in Branson, you step into a modern day fairy tale, complete with mystery, fun adventure, and a princess to save. When you try to save the princess, you’ll find your way through the mirrored walls hidden with the maze of mirror. You’ll work your way through the corridors to rescue Princess Hannah of Savannah from her fateful maze of mirrors, archways, and hundreds of mirrored walls. You’ll need to walk through the maze of mirrors, as there are many locations that have infinite reflections in every direction. When you participate in this fun activity, you need to answer the question “Are You The Chosen One?” Then you will be given a mission to rescue Princess Hannah. Your adventure inside the mirror maze starts with a search for the Princess before the time runs out. Your quest will be joined by Queen Emmy, the Wizard of the Golden Globe, and King Oscar and they cheer you as you search the princess. As you try to search the princess, you’ll navigate your way through the more than 288 twists and turns. Your reflection will hinder your goal as you bump your way through this world of mirrors. The Shoot for the Stars Mini-Golf at Hollywood Museum gives you the chance to experience on how to be a Hollywood star. Conveniently located near Hannah’s Maze of Mirrors and Castle of Chaos on Highway 76, Shoot for the Stars Mini Golf is more than just putt-putt golf, you’ll enjoy a themed interactive golf experience. Playing mini-golf inside the large museum facility is a great way to bond together with the family as you can help each other with your aim while enjoying a friendly competition. It’s also a fun way for kids as it can help improve their game and see themselves perform better at every stroke. A fascinating attraction in Branson, Shoot for the Stars Mini Golf gives you the opportunity to act like a star. At Hollywood Entertainment Center, you will see beautiful landmarks of Hollywood that include Grauman’s Chinese Theatre, Capital Records building, shops on Rodeo Drive, and the Hollywood Bowl. Of course, you can always have the chance to play mini golf around and through palm trees, parties and paparazzi and discover tips about becoming a star at every hole. At Shoot for the Stars Mini Golf, a coif by your hairdresser will cost you $600, a limo driver will carry your bags on Rodeo Drive, and the paparazzi will wait for your arrival at VIP events. 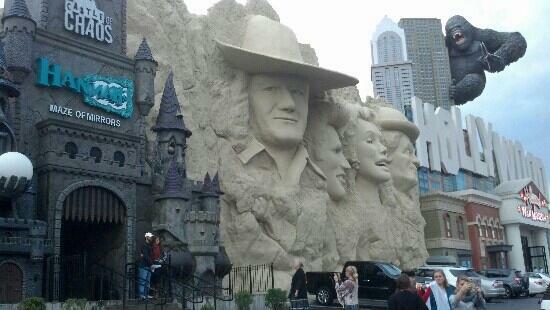 Besides playing a fun mini golf game with the 18-hole course, you’re going to become a Hollywood star in Branson. From being discovered as a star on Hollywood Boulevard, your wisecracking agent, Marty McBooster will guide you on the course with hilarious words of advice at each hole. As you make your way toward the final golfing challenge at the Walk of Fame, you’re sure to get lots of star-quality photo ops. As you go around the Hollywood themed mini golf course, Shoot for the Stars Mini Golf lets you enjoy the fun in a unique way. This mini golf course is perfect for everyone, and let you feel like a star without having to travel to Hollywood. In a typical style of Branson, the big Oscar statues resemble the real ones. Everything you experience here gives the feeling of the real Hollywood, intermixed with fake palm trees and some goofball figures of Hollywood styles. The Castle of Chaos at Hollywood Entertainment Center is another unique attraction in Branson where you can experience for yourself a thrilling and chilling adventure in a haunted house and a video game ride. As you enter the Castle of Chaos, you’ll get buckled as you take your seat and get ready for a 5D adventure through the supernatural unknown. This 5D adventure is a 3D film merged with motion, special effects and an interactive shooting battle. This fascinating attraction is nestled inside the same facility where Hannah’s Maze of Mirrors and Shoot for the Stars Mini Golf are also located. If you’re a video game player, you are sure to enjoy the ride being thrown into a real life video game as you battle the forces of evil while feeling the chill of a supernatural wind on the back of your neck and the warm splatter of an ominous liquid as you fight for your soul in the Castle of Chaos. By the way, the castle is really full of chaos. You’ll feel like spinning and turning as you are thrust into a world where anything can happen. You’ll probably end up shooting anything and everything as ghoulish figures burst out of the screen in the dark and eerie room. Also a fascinating attraction in Branson, Castle of Chaos is where you can experience the scariest moment of your life. The 5D Adventure is a must see family attraction. This action-packed indoor activity features a heart-pounding motion, special effects, and an all-out shooting battle against evil. This haunted attraction will make you feel like you’re watching a frightful movie. Prepare to have a blast as you’ll discover the paranormal mysteries in this unique adventure. This 5D Adventure is an interactive shooting game that combines elements of 3D film to create a fascinating adventure ride that you probably haven’t experienced before. This unique 5D attraction is combined with a 3D film experience, interactive ride, and video game in one scary adventure. If you like playing challenging game and interested in riding the world of paranormal activity, this maybe the video game you are looking for. To start the fun, you need to be prepared to hear, see, feel, and smell as your 4 senses will be used to immerse you fully into this unique form of entertainment. The use of 5D will give you a memorable chaotic experience that you can brag to your friends. This 5D attraction has received great reviews from visitors boasting about the unique style of entertainment and its great graphical presentation. 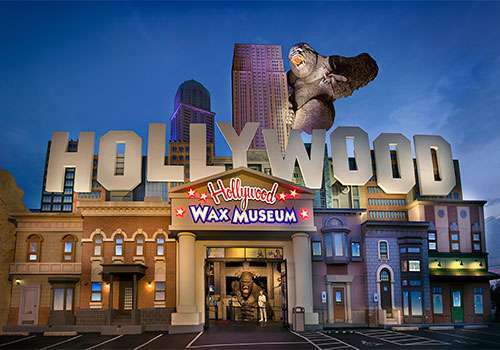 If you are looking for some fun things to do to this winter season, visit the Hollywood Wax Museum Entertainment Center and see for yourself wax figures of some famous Hollywood celebrities and get the chance to enjoy other exciting activities.